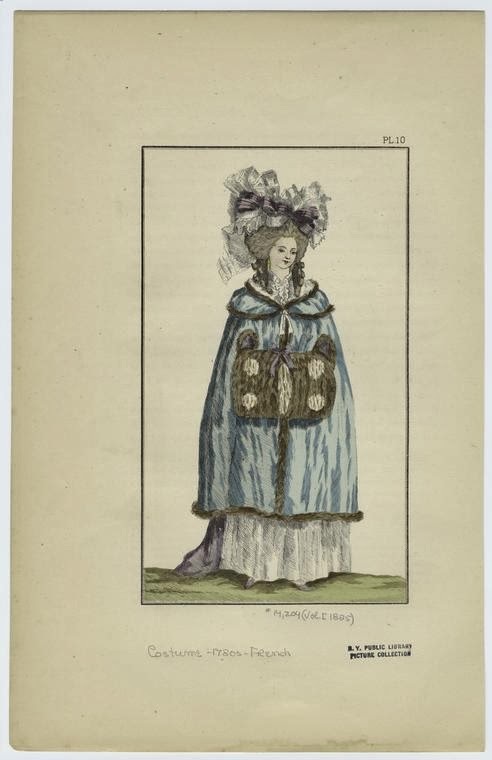 The diary of an eighteenth century French noblewoman, and information relating to her world. A very happy Bastille Day to all of you! Now is a great time to turn to American Duchess who is having a sale of up to 30% off selected items, as well as free accessories with a shoe purchase, or $5 off accessories purchased alone. She also has a new shoe out for pre-order, and we all know how tempting those can be. The Margaret Hunter Millinery Shop has an opening for a temporary PAID intern in Colonial Williamsburg. Anyone in theatre, the arts, textiles, museum studies, or living history knows how rare it is to find a paid internship, even at the best of organizations. 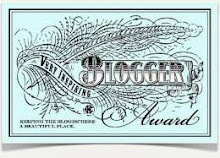 For more information you can see Abby's blog, Stay-ing Alive. Tomorrow the Marquis and I have been honored with an invitation to join the King on his hunt. I have debated whether to ride with the men, or keep to the carriage, and I think I shall do the latter for it is very hot at present. We have smaller apartments at Versailles at the moment, as Mme A- delays in quitting her own. I believe she does it to spite me, but I will have them eventually. My duties for Mme the Princess Elisabeth keep me busy, but in the evenings Thierry and I join any of the myriad card parties, suppers, or gatherings which we must soon reciprocate I think. Until the apartments are ready for us there is always the excuse of not being settled. I spend much time, when I have it, choosing furnishings, and have written to my steward for many things from Saint-Saturnin and Portaberaud. Thierry is in desperate need of new clothes, but is hesitant to allow me to purchase them for him. He still is unused to spending money freely, and at times I feel much the same way. Count Axel von Fersen is expected to return to Versailles tomorrow and, having been a particular favorite of the Queen's, will likely return to her inner circle. Ever since her miscarriage last year the Queen has occupied herself with her petite hameau, which is said to be a charming and rustic idyll, though I have not received an invitation to see it. The Dauphin's health sadly continues to decline, though his sister, Madame Royale, has all of the robustness that the other lacks. The worry that this brings does show itself in the Queen, and indeed in my mistress as well who cares greatly for her niece and nephew. It is to be wondered whether Mme Elisabeth herself will ever marry, but seems likely that she will not and shows no inclination towards that calling, but rather would prefer to devote herself to God and to easing the suffering of others. She is an easy lady to love and I find myself becoming very devoted to her. Every summer I have these grand plans about all the costumes I am going to make, and then I'm lucky if I get three done. Sometimes this is because of administrative things for the University, and sometimes it is due to my own distraction. 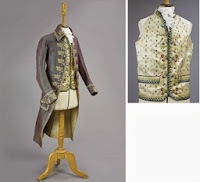 Right now I should be building the Tudor Transitional project which has been on hold for months, or starting on the late-18th century travel outfit that was designed years ago. 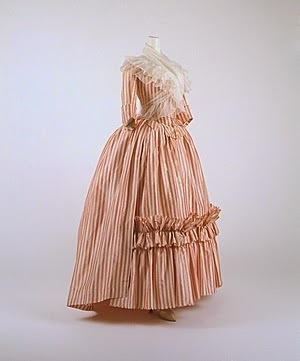 Instead I find myself with a strong desire to "knock out a sacque-backed gown" as if it were just that simple. 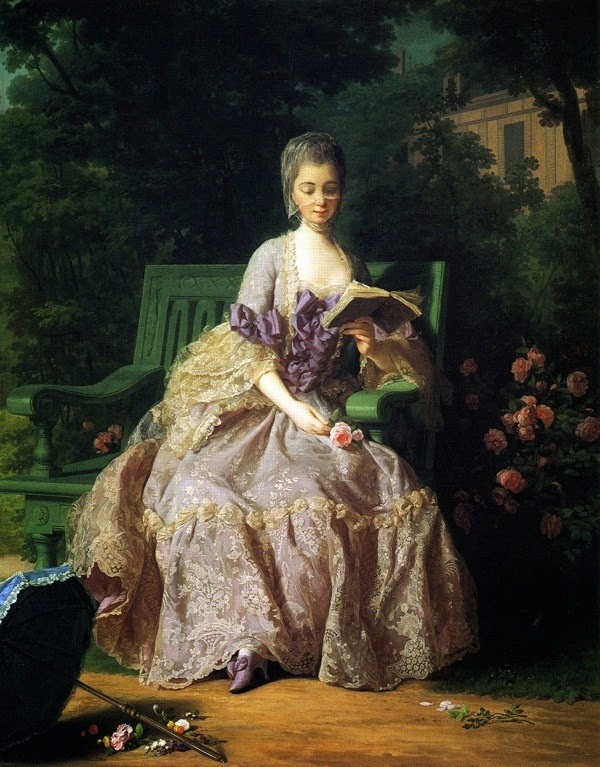 This portrait of the Princesse de Lamballe is one of my favorites, with the cream lace over the soft lilac color, and the deep flounce at the hem. I go back and forth on whether or not I like the echelles-style stomacher, but the sleeves are luscious. Speaking of sleeves, these ones from c.1760 have a really interesting lace pattern, gilt trim, and the scalloped edge that give them that wow-factor I know I'm drawn to. 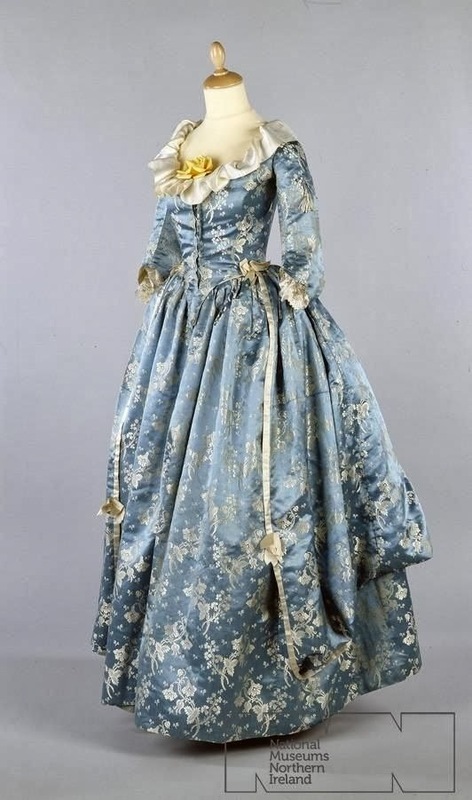 I'm also drawn to this 1750s court dress, and the way the passementerie is really large at the front edges of the skirt, and then scaled back on the bodice. I'm a small woman, so large trims can overpower me if I'm not careful. 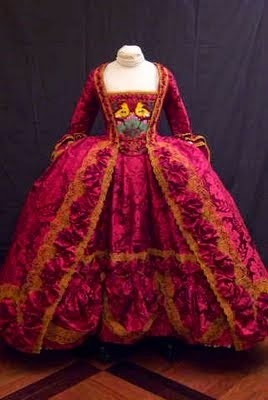 Someday I will have a court dress like this, but that is not this project. Must stay focused! 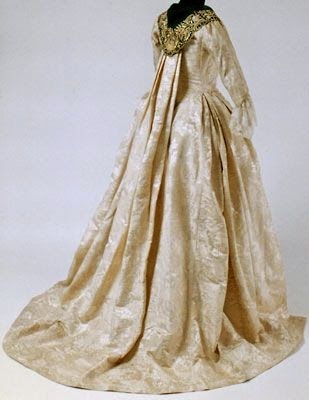 It's the way the back pleats appear to hang off of the neckline trim on this 1775-80 ivory moire silk. There's a simple beauty to that which I cannot help wanting to recreate. 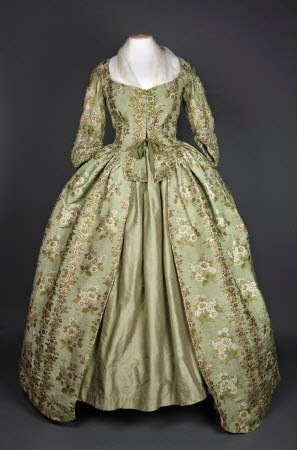 Finally, though this c.1780 sage gown is a different style, I think the color combination would be stunning with some taupe and gilt trim. 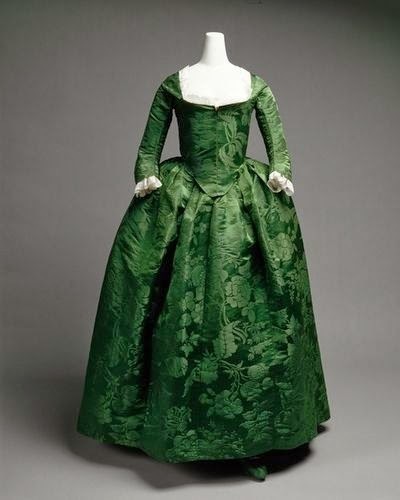 It would also go with my sage-colored Georgianas from American Duchess. Surely I can squeeze this project in, right? 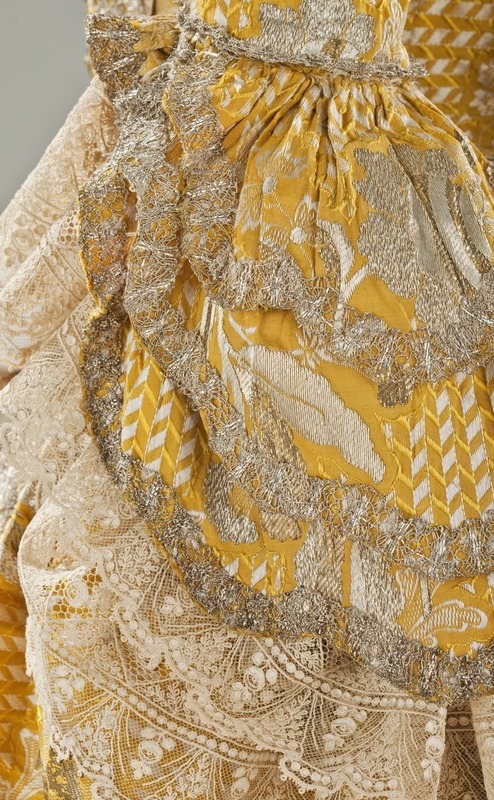 Maybe with a coordinating Bergere? There is much to report and I will begin by saying that I am in Paris, staying at present with my friend, Elizabeth, Comtesse de R-. Growing impatient with waiting for word from Versailles and Mme the Princess Elisabeth, I convinced Thierry that we must seize the reigns and take ourselves to town to fight for our opportunities. A friend from the Ferme was able to find Thierry a small charge at court, and although he does not enjoy the position or the expectations of ettiquette, he is doing well in the eyes of all he meets; a rare thing for such a place! Meanwhile I found out that it was one of the older harridans at court who had spoken against me, and told such lies that Mme Elisabeth was forced to refrain from inviting me to return. Mme A-, my enemy now in all things, had a young daughter whom she wished to place instead, and seems to have felt that my position was the one which would be simplest to obstruct. So it was that I bent all my strength to the purpose of thwarting her. I gained the ear of the gentleman whose charge it was to oversee the Princess' household. This was achieved by finding out from Msr. Poisson that his mistress was pregnant and confined to her house near the Place Vendome. The lady, a Mlle. R-, reminded me of my friend Elizabeth's terrible boredom and frustration with being thus confined, and I thought that if I could make her acquaintance it might prove useful. But how to do so? My maid, Marianne, was sent to deliver a letter and a book. A copy of La Nouvelle Heloise, which was so much in fashion only a few years ago, but the letter was to be addressed to me. Naturally this necessitated that Mlle. R- would need to find me to return both since there had been a mistake. I created a story that the address must have been given badly, and that the lady from whom they had been sent had a similar name to her. In recompense for her time and trouble I returned a basket of fruit, purchased at great expense from the person now living in the l'Hotel de Sully with its Orangerie. As hoped she sent back a note expressing her gratitude and inviting a visit, should I ever wish. Naturally, I took her invitation to heart and feigned surprise at her condition, becoming very concerned for her and offering my assistance. We talked of many things, and soon she was telling me about her patron, and seemed relieved at my warmth. To stave off rumors that might abound from my visit I dispensed gossip with other acquaintances in the area, while delivering charity to the less fortunate in equal measure. While accomplishing this connection, I also attended as many events as I could, was seen at the opera and balls, and attempted to be as charming as possible, while not offering any invitations at all. Many asked me how long I would be in town, or where I might take a house, and I told all who asked that there were plans I was not able to divulge at present. Soon the rumors swelled. It mattered little what I said or did, or how genuine I was, many would speculate wildly simply to say the newest thing. What mattered was that I was talked of. In due course hearing of me, the Head of the Princess' Elisabeth's Household mus have mentioned me to his mistress, or she to him, but he sent me a letter requesting a meeting, and duly I answered and he came. 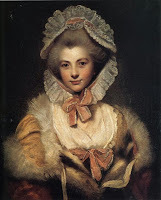 I accepted his offer of a position as Lady to Mme Elisabeth and waited. Callers arrived, and messages of congratulations, for word travels quickly in Paris. A visit with the Princess herself was scheduled for the next day, and so I went; only to arrive and find a chagrined Princess who told me that the position had previously been promised to Mme A-'s daughter, and it was a promise which could not be broken. Humiliated, I returned to my hostess, vowing to find a way to correct this wrong. 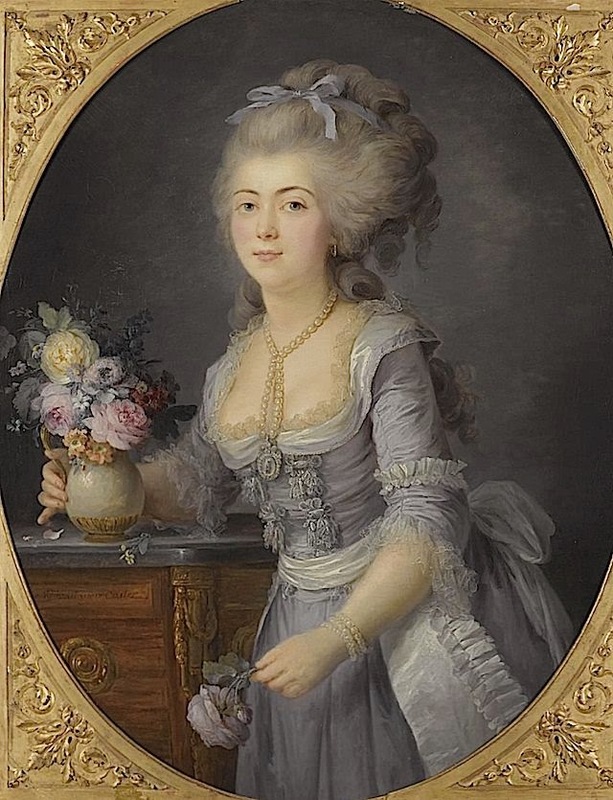 Elizabeth agreed to help me, and she asked her husband, the Comte de R-, to use his influence to make the husband of the young woman an attache to the French ambassador to Milan, for he has many contacts there. Soon the young woman was packing for Milan instead of Montreuil. Still not deterred Mme A- came to call on me and made the most horrendous accusations about my virtue and husband's claim to nobility, and left me in little doubt that the fight would be a long one. I feigned innocence, of course, and told her that I had nothing to do with the decision whether or not I serve my Princess. She then told me that another of her daughter's would serve in the other's stead, and I was not to interfere; which meant of course that I must. The only thing which makes one more sought after than a new position at court is misfortune. I had more visitors offering their condolences in the days which followed than I had before, and I told them all about the threat of Mme A-, who they told me was known to be a drunk, and a discourteous person not well-liked by many. This meant that I must have other allies who would help me in destroying her ambitions. One such ally turned out to be Menars himself. Hearing of my rejection, he visited me and offered his support. The old woman had been rude to him on more than one occasion, and he deeply resented her insistence on interfering in court events. Mme A-s next daughter was a tall, intelligent woman, married, with two young children already. Being of a steady nature, she would be difficult to discredit. She was, like her mother, ambitious. 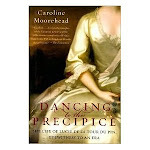 Menars bribed one of the Princess' footmen to report on a conversation between the two of them at their first meeting. He said that she expressed interest in founding a convent school, but lacked the resources to do so. A letter was written, anonymously, offering her the opportunity to take over care of the Convent of the Sacred Wounds in far Aix-en-Provence. Another "footman of the Princess'" delivered the letter, his hands liberally gilded to do so. Funds for her journey, a letter of introduction, and instructions not to delay, all convinced her of the genuine nature of this charge which could only come from Mme Elisabeth herself. If the companion letter sent to the convent itself does its work, it will be months before the lack of response from Versailles reveals this to have been a mistake. In the meantime her timely resignation letter will explain her absence. Still, the old woman persisted with a third daughter. This one charming, jovial, and fat. She expressed her strong desire to serve the Princess, and her husband's already strong position at court meant that they were ill-inclined to leave it. Gossip was my rescue here. Soon it was being whispered in every corner and into every ear that Mme Elisabeth's "fat, new lady" would be unable to endure the strain of her schedule at Montreuil. Even the Princess herself began to have her doubts, while the mother blustered and blamed me, but the whisper never came from me; but only from all of the others who had cause to hate her. The only person I spoke to of it was the mistress. She whispered into her patron's ear, and he convinced the third daughter to attend to one of the King's aunts instead. There was yet one more problem to solve. One more lady was put forward, and this time by another member of court, Mme A- now being discredited by all. Even as confusions swirled about why her second daughter had left court and who had sent her thither, a matronly lady of minor nobility was shuffled to the fore. One look at her and I knew I simply had to wait. Though her piety was sure to please her mistress, there was nothing else to recommend her, and the plan was soon given up and she was shuffled off again. I asked to meet with the gentleman of the Household again, and was told that, should I still wish it, the position was mine. Mme A- leaves court in humiliation shortly, and her own lodgings are being prepared for me, as the Princess still does not reside at Montreuil in the evenings. Thierry will join me there, and together we will celebrate victory. I only seem to tire more and more easily, and most of what I must report is of no consolation. My step-father has been forced to relinquish his position as Magistrate in Riom, and Maman is in a state over their prospects. I have invited them to visit us at Saint-Saturnin in April, but hope that they will not stay long as I must to Versailles. Although, that is not completely certain. Msr. Poisson writes that a rumor says my position as Lady to Mme Elisabeth is opposed by some at court. A letter from the Princess herself confirms my fears as she urges me not to hurry from Auvergne at present. This might be mere kindness on her part, were it not for the rumor. No sooner had I sent my package of sweets to Christine with a letter, than a letter and a package from her arrived for me. She sent a necklace, and continues to urge a visit to Sweden as soon as may be. The Marquis relents a little, and says I might go to see her after his much-anticipated journey to England. For the moment, we wait for kinder words from many quarters, wait for Spring, and enjoy the pleasant fog of wine and books. There is a country dance in a few days time, and I think I must appear, if only for a few moments. A brief letter is all that I have received from Christine in these few months past, and for a time I was quite concerned about her health. Indeed, in its brevity there was much sadness to her missive. Her step-children tire her, and her new husband is much absent; though that at least seems a blessing. She reads as much as possible and retires early. She says little else and I suspect that there is little else to say of any consequence. I tried to convince Thierry to travel to Sweden to visit her, but he says the expense cannot be borne. Instead he suggests a visit to England to see friends of his, former colleagues really, but I am very wary of that venture. I am putting together a package of delicacies for her, which will travel slowly but safely this time of year. We have also heard little from the Marquis and Marquise de Menars since the news of her expectation came. I imagine they are preparing for their little one and are not concerned as nearly with old friends. My own Maman writes almost daily of her trials and worries since her husband's injury. He will lose his position as magistrate in Riom if he cannot recover soon, and the family's fortunes will suffer. They will look to me then, as ever, thinking that I have the means to save them, which I do not. They could live at Portaberaud, my home in Riom, but I have few servants there to wait upon them, and little money to run a household of so many in addition to my own. Lespinasse is sold, and Opme has tenants, and I will not suffer having them here at Saint-Saturnin with us, or at least not my step-father who, in any case, dislikes leaving Riom. 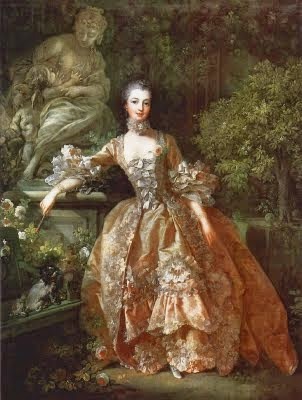 It remains, even so, that we go to Versailles in the Spring so that I may attend Madame Elizabeth as requested. We will likely have apartments at the Palace, but be they ever so cramped and dismal, they will cost a tremendous amount to keep, in addition to the other expenses of our servants, food, clothing, and entertainments. The burden will only be lessened if Thierry is also able to receive a charge, but nothing is very promising yet. While we wait for Spring to arrive I busy myself with finding ways to cut expenses, freshening and replacing what is disused, learning more about the workings of our kitchens, reading, riding, and cataloging the library left to me by my late father. Some of the books are in need of much attention, and a woman in the village was recommended to me as the person to restore them, so she is to come and look at them soon. Tomorrow I believe I will sew, write some letters, and try to better understand the register of tenants and servants who live by my largess. The list is long and complicated, and I suspect that I will need the assistance of my steward and his son, Saint-Dennis. This year continues very ill for us. Caught between his family's reluctance and his own inclination, Thierry waited too long and we were not yet in Riom when his grandmother passed away. In the end she barely knew any of her own friends or relations, but she had asked that little fuss be made over her remains, only that she be remembered in the spring when the flowers were in bloom. I had some hope of expecting a child this last month, but it also came to naught, and as I had not confessed my thought to my husband he is not in the least concerned with what might have been. Instead he worries without ceasing, over what might be if we do not find either an increase in our income, or a manner of relieving our expenses. Meanwhile I feel that we live comfortably, though not lavishly, and have myself been far more troubled by such worries in the past. My step-father continues very ill, and does not speak after his accident, which has Maman quite distressed though Andre does his best to soothe her, being again at home in Riom with them and Matthieu. My cousin, the Duc de Bouillon, writes that he has papers about which we must speak, and he urges me to travel to Paris, but does not state their purpose. Indeed, I may soon have reason to travel there in any case, as Madame Elizabeth, the King's sister, requests my return to serve her once more. I need not come at once though, which is well as the roads are especially treacherous at this time of year, and only today we had snow. The charge at court may present more income, but would bring attendant expenses which could vastly outweigh the gain. As ever, the way forward is fraught with shadows. We have only just returned from the wedding of Adrienne's daughter, Emiline, which I must say was very lovely. The young couple seemed genuinely fond of one another, which is a pleasant start to any marriage, though it is no guarantee of happiness later in life. We arrived home to news from Thierry's family in Riom that his elderly grandmother, his father's mother, is gravely ill. The family suggests, in their often rather odd way, that he need not trouble himself to travel to Riom to see her, and in the next sentence hint that she may not last much longer. Naturally he is in a state of bewilderment over how to proceed. Maman writes as well that my step-father has suffered a fall and severely injured his head to the extant that he has not spoken since, although it has been several days. She says that he appears confused, and that the doctor is waiting for what he thinks is brain swelling to abate before trying any further action. To complete our rather dismal beginning to the year, Thierry confessed to me on the journey home from Briancon that we have been living slightly above our means, and that without his income from the Ferme being replaced by the end of February, we will need to make some adjustments. It seems that good fortune never can last. I am, this time, determined to remain cheerful, and more to the point I shall endeavor to be resourceful. 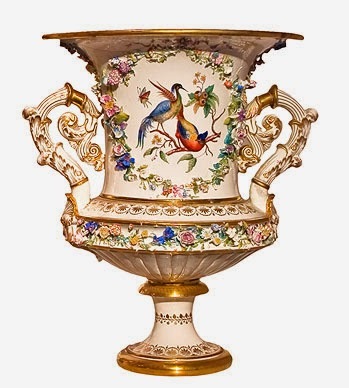 If we stay in Saint-Saturnin there will be no need to spend as lavishly as we would were we in Paris or at Versailles. We shall entertain seldom, travel very little, and put off those renovations which we had discussed. Thierry reminds me, though I had not needed to be told, that children are an expense themselves, and it is good that we have none at present. I do believe that the money for them could be found if needed, but of course there is little need for concern in that regard at the moment. Faced with indecision at the beginning of last month, I chose to travel part of the way to Paris with my dear husband, and to remain in Riom at Portaberaud near to my mother and half-brothers. Thierry meanwhile wended his way north to meet with Msr. Poisson; but, alas, when he reached Paris the charge had already been given to another. He then found his way back to Riom, where we chose to spend a rather quiet Christmas with my family. My step-father was in a wretched temper, as he so often is, and we were all too glad to return to Saint-Saturnin. A new year begins, and we can look back on the old with some satisfaction, even though some troubling news came at the end of the old. There is a peasant saying about a death and a birth in the turning of the year, and while I give no credence to such things we did experience both in some measure. The child of my maid Pauline, the one we called Little Hercule, was suddenly seized by a fever while I was in Riom and died a few days later. I have done what I can to express my sympathies and to cheer Pauline, but her grief is considerable and it is hardest of all when a child is taken. I was reminded strongly of my feelings following the death of the Comte de Rodez, my dear friend, and have resolved all the more to find out the truth. As to the birth, it is yet to come, but as I have feared since her marriage, Clementine, now the Marquise de Menars, is expecting her first child. This will only show more starkly against my own barren state as I grow older still. My birthday passed in a mood of some somberness as I had just received word of Hercule's death, which affected me more than I could anticipate. The Marquis, having no great connection to our servants as of yet, was not himself shaken, but did his best to cheer me though I cannot say that he succeeded. It seems that great events will happen in threes, and we travel tomorrow to Briancon to the home of my friend Adrienne whose eldest daughter, Emiline, is to be married on January 4th. I know almost nothing about the man she is marrying, who is of an old family, though not ennobled and has some business in lace and wine, but that is all that I can really say. No doubt seeing the child of a friend married, though the friend be somewhat older than I, will cause me to fall into a disagreeable temper. I do so dislike the winter. No sooner do I express in writing my hopes for my dear husband, than they are answered. The Marquis has been called away to Paris by Msr. Poisson with news of a charge, and so he is busy packing the necessary items for the journey north. At this time of year it will take him at least four or five days, I should think, and if his business is not soon concluded then we may not be together for Christmas; all of which inclines me to wonder if I should not travel with him and visit our friends in Paris and at Versailles. He leaves within the hour and so I must make a decision quickly; to remain or to leave Saint-Saturnin once again? I am a university professor and costume professional who calls Virginia home. 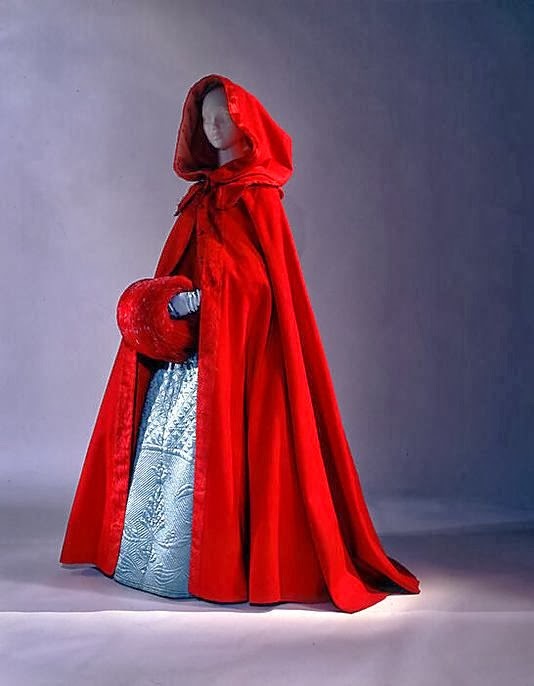 Interested in costume history, and history in general, I endeavor constantly to better understand life through those who lived it.